David "Auric" Hernly of tronsector.com paid a visit to Luna City Arcade yesterday. 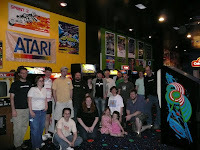 Several weeks ago I hosted a private Game Day for the company staff of Think Geek. Everyone had a great time! A really nice group of people. They recently started up a blog and here is their posting about their visit.